Want a Christmas train for your tree? 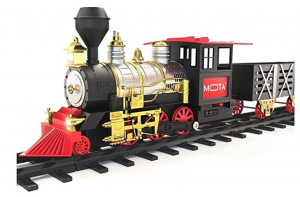 Grab the MOTA Classic Holiday Christmas Train Set for just $26.74! (Regularly $69.99) This comes with a truly signature locomotive engine with cargo cars to trail behind along the tracks. Toggle on real lights and sound, and even add mineral oil. Keep in mind, Amazon pricing can change at any time! Don’t wait to purchase this deal or it might be gone when you come back!